Why aren’t there more women in the SFF section? During my travels, I started to notice that SFF sections in airport bookstores had disturbingly few women. So at a certain point, I started taking photos and counting. In this informal survey, only 18% of the books on sale were by women. * I should note that gender is not the only disparity in bookstores, it was just the one that I could count while waiting for an airplane. This is what the airport SFF sections in bookstores look like. 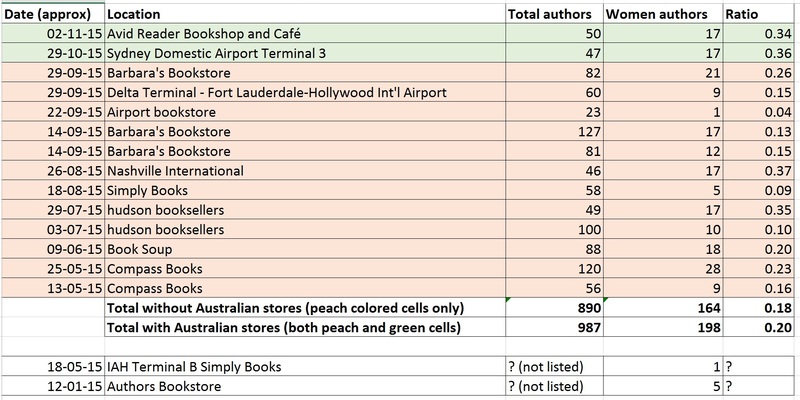 It’s easy to chalk this up to something like, “Well, women don’t write as much SFF.” The problem is that I know that the gender breakdown for published SFF in the US doesn’t support that. According to Strange Horizons, in 2014, 53.9% were by men and 42% were by women and non-binary authors. So why, then, were the numbers so disparate? Fortunately, after one of my tweets, Christine Thompson, the buyer at Barbara’s Bookstore reached out. This is the only bookstore that got in touch with me. (And please note, the improvement in their numbers after I brought the matter to her attention.) She agreed to sit down with me and talk about the problem. As we talked, it became clear that the fault doesn’t rest with a single source. It’s the result of a ton of decisions, each of which is probably fueled by unconscious bias and then reinforced by a feedback loop. For instance… When airport booksellers are stocking books, they look at multiple factors, one of which is the print run numbers. Higher print runs mean that the publishers have more faith in that book, ergo, it will probably sell well. When publishers have an investment in a book, they are more likely to invest co-op dollars in it. Which essentially means that they pay for endcaps and placement of certain authors. Those books sell better, because they are out in front of readers. SFF has a long history of bestsellers written by men. So men often have higher print runs, which means… You see the cycle? And while one can say that it’s all economics, and it’s about what people want to buy, it’s much harder to buy a book that’s not in front of you. And certainly, not all men get huge print runs. Being a guy doesn’t guarantee a stellar publishing career, but… it does stack the deck 82% in their favor. One of the questions that came up was: “Is it the big houses?” They are the ones with the co-op dollars. 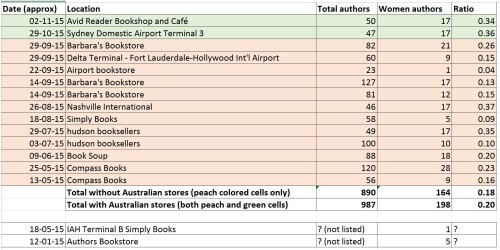 I have no idea what the gender breakdown of SFF is by publishing house, but Christine thought that might account for some of the disparity. The big houses are the ones with the most money in the way of co-op dollars and print run sizes. Smaller houses might create the parity in terms of publishing numbers, but with smaller printruns might have a harder time getting representation into stores. It happens again when you look at which books get reviews. Again, this is a major source for discovering new authors. But the final thing that came up in our conversation was that, even if a bookseller wants to improve the representation in their store, it’s difficult to do so because catalogs aren’t sorted by gender. This… this is something we can fix though. We can crowd-source a list. That’s right. You can help crowd-source a list of women and non-binary authors in SFF in order to help book buyers create a more balanced list for their stores. Because this disparity is reinforced by reviews, which focus on authors who are publicly identified as male, it is difficult for booksellers to discover authors who are not male identified. You can also use the list as a discovery guide. If you had asked me, before I started this informal survey, if a young woman should choose a male pseudonym, I would have said “Absolutely not.” I am less certain now. *Methodology: I counted the total number of authors. Then I counted the women. If I couldn’t tell and/or didn’t know, because the author used initials or a gender neutral name, I counted them as male. The reason I did this, instead of leaving them out, is because I was looking at the perception of gender rather than actual gender. If a woman is making choices to obscure her gender, that says loads about the current environment. Edited to add: Ro Smith, in comments, has made an excellent point about how my methodology contributes to the erasure of non-binary, agender, and genderfluid authors. When I am counting this year, I’ll be counting the three categories Ro suggested: Stereotypically male names, Stereotypically female names, and gender-non-specific names. I encourage anyone who is also counting to do the same. This is a great effort! I love the idea! I actually know a ton of women scifi authors, but a great many of them self-published. Many of them self-published because of the treatment they got from agents and publishers who did not want to publish women authors in SF&F. That doesn’t really solve airport booksellers problems, though, unfortunately. I’m looking forward to seeing the list in its entirety when you get it going. Could we see the list as it is populated? That way we won’t all be adding duplicates. Yes, there’s a link to the spreadsheet in the post. Since it’s sortable, I’ll go through periodically and cull duplicates. I can’t wait to see the list as it evolves. I have added quite a few titles in since our talk, and they are selling, but I’m always looking for wonderful new things. Thank you! If you hadn’t taken this seriously, we’d still be in exactly the same spot. A few years ago I went to a fairly new bookstore, Dymocks at Fountaingate. I met the manager who was very pushy, pushing all these books by men. He only stocked a couple of fantasy novels by women and I don’t think he had any SFF books by women. I noticed and commented. He said, “I stock books I enjoy” as if his taste was the only good taste. He also pushed books by a male author who I said I’d read and disliked because of writing flaws. Regardless of my comments, he insisted on me buying the bloody book and wouldn’t take no for an answer. I walked out after paying for the damned thing and later gave it away, unread. He didn’t listen to me or my taste as a customer, he tried to convert me to his “correct” allegedly-masculine tastes and refused to hear a woman say “no”. A year or two later that bookstore closed down. Perhaps bookstore buyers need to realise that most readers of fiction are women and that catering to a diverse audience will increase their chances of staying in business like Impact Comics, a local comic book store that has 2 or 3 women on staff and, apparently, a book club with some vocal women. I’m planning to check it out and it’s already resulted in buying Black Sad volume 1 in preparation because I was in there TALKING TO A WOMAN WITH GOOD TASTE while my partner picked up Alias volumes 1–4 for me as a late Christmas present. And I bought Fables volume 1 because I’ve heard wonderful things about it and I felt comfortable talking to the woman at the sales counter. PS I grew up believing that if a woman wanted to get published she had to publish under a pseudonym like Henry Handel Richardson and George Elliot. I was really surprised when I discovered that Ursula le Guin and Andre Norton were women (?!). I think a combination of awareness-raising like you’re doing and women publishing under pseudonyms then coming out once they’ve been ‘recognised’ might work but, in the current social media climate, it might be difficult to manage. Just to clarify, your count above is the number of books, not the number of different authors, right? I was wondering about why Australia had higher numbers. If you remember, were there one or two prolific (maybe Australian) authors with a lot of books or was it spread over a number of authors? My count is the number of authors, not the number of books. If I were counting by book, it would be a lot more depressing, because they frequently have all of a series by someone like George R R Martin, and one book by Lois McMaster Bujold. From the authors that I talked to there, part of the difference also is that in Australia there were a bunch of best-selling women early on in the development of the genre and that’s led to less discrimination. It’s still there, but not as pronounced. But again… a sample of two. I’d love to see someone do this sort of survey in other countries. I’m one of those women authors who chose to publish under a gender-neutral pseudonym. I was advised by a very successful author to publish under a man’s name, especially because my book was first-person from a male. I’ve come to think since then that maybe I shouldn’t have supported this bias, but I honestly do know of men who balk (often without realizing it) at reading a book, especially of the sci fi or thriller genre, written by a woman. I’m going to keep publishing under the neutral name, since I’ve already started building a fan base with it, but I don’t go out of my way to hide my gender when posting on social media or guest blogs. I will definitely be checking out this list and adding my own contributions of some of the wonderful female SF/F authors I’ve read. There is a *real* problem with counting gender-non-specific names as male. Non-binary, agender, and genderfluid people are more marginalised than obviously CIS women, and often they choose gender neutral pen-names specifically to avoid assumptions being made about them. Not to mention the fact that many women go by their initials to do the same. The idea that I would be counted as male just because I write under ‘Ro Smith’ rather than ‘Rosemary Smith’ is pretty galling. This is contributing to the lack of visibility of women by assigning as male the women who are there, as well as non-binary people. A more interesting (and just as easy!) study would have been to count stereotypically male names, stereotypically female names, and gender-non-specific names as separate categories. It’s then more interesting and accurate to discuss how many more male-presenting names are present, versus female-presenting names and names that are non-specific. More interesting speculation can then be had about the number of people who are either happy to or choose to obscure their gender. But this above? The above is highly problematic. Ro, thank you. When I count next year, I’ll do that. That lack of representation and visibility is why I set the list to include non-binary authors. If I may clarify? The reason I counted the way I did was not because I think gender neutral names *should* be counted as male, but because I was making guesses about how people were viewing them. What I was looking at was perception, not who the actual authors were. If I were doing that, there are women who write under specifically and unambiguously male names who would have to be moved to a different column. Many cis-women who write with initials do so to obscure their identity because being anything other than male can hurt sales. But I do see your point and will change the way I count this year. The other problem with counting gender neutral names as male is that many of us were given names by our parents that are now seen as gender neutral – sometimes even if they weren’t when we were born. In our cases, it’s not a matter of wanting to hide our gender – it’s just wanting to use our own names. Please correct the title, you stuttered. Please don’t make jokes using disabilities as your punchline. My name is gender neutral. The only choice I made was to publish under my maiden name rather than my married name. (That’s ego and a bit of a “sod off!” to my high school guidance counselor, admittedly.) While I can’t be certain if my gender neutral name has helped me, I admit that I’ve been more than willing to LET it help me in the arenas it might. However, I’ve never hidden the fact that I’m a woman. I have an incomplete but growing list on my website Galaxy Girls and Lady Knights, which focuses on celebrating women in SF/F! I love this idea! I will add to the list when I am out of work this evening! Thank you! One of the things that Christine has said is that having a sortable database, with ISBNs would help booksellers a ton. Hook up to http://www.worldswithoutend.com – they have a database of both all and women SF/F authors already started. I have no idea how complete it is, but I know I added lots when they were building it. What a great post. I’ve been trying to form a coherent answer to this question for years. If women buy 60% of fiction overall, why do women only account or 37% of science fiction sales? (Bowkers 2009 data) This is a big piece of the puzzle. I agree with Nalini Haynes above. I think another piece of the puzzle is that even the big name publishers are still relatively small shops run by older American gentlemen who do not understand that they are not their target audience. They might have been once, but times have changed. Their target audience is bookaholics – typically women. And those women don’t like the same books they do. So bookaholics don’t buy the sci-fi published in the quantities that they do every other genre. And it becomes a self-defeating cycle. Looking at book buying data from Publishers Weekly, you see that currently adult science fiction is the lowest selling genre of fiction. Using their numbers, I estimate that alienating women book buyers is costing the science fiction genre at least 3 million sales per year. It seems like an awful lot of money to leave on the table. I would assume the same goes, probably to an even greater extent, for writers of color and ignoring international markets, but those numbers are harder to track. Good luck! When Mary and I talked, I suggested putting pressure on the publishers to create a SFF imprint specifically for women. There are certainly imprints for everything else, so why not? Imprints, especially new ones, tend to have their own co-op pools, marketing, editors, etc. this is a good point! I’m a bookaholic, and it’s interesting to me to think about how my reading has shifted. I used to read ‘hard’ scifi – but now that is very very rare. I read the occasional romance, quite a few cozy mysteries, and a lot of fantasy (medieval, epic, urban, even romantic). Predominantly written by women and/or featuring a women protagonist or two, and with a surprisingly high percentage of self published. These days it seems like the scifi is so often military based that I rarely even glance at it. What happened to tales such as the Witches of Karres or the Telzey tales? Does all futuristic scifi really need to involve war? I would really appreciate it if the list would include forthcoming titles of note as well. It really needs to be an ongoing document. Please. I will keep it up and remind people about it periodically. This is appalling but not unexpected. Of course, there are possibly some underlying assumptions being made by buyers about travelers being male so SF/F choices should also be male. I could spend hours adding books, so I hope that everyone will add a couple from their recent reading list. Looking forward to a populated list. I apologize: before I got my head screwed back on straight I added books that were not SF/F. Please remove (according to the view list) #178, 180-182, 184-187, 189-191. They are all wonderful books by diverse perspectives and talents, but they are not SF/F. Thank you for not only spotting an issue, but making a forum available so we could help fix it. It gets wearying to constantly see problems and have no clue how to help, even in a small way. I’m afraid my enthusiasm ran away with me. J.C. Nelson is actually very interesting, because in the few write ups I’ve found, that person uses no gender pronouns at all. It’s a great series that deserves a wider readership with a female protagonist, so I think, maybe female, but I don’t know. If you don’t know, then I recommend not guessing. It’s better to be vague than to misgender someone. Out of curiosity, do those numbers reflect YA SFF at all? Also, is it okay to add YA SFF authors to the crowd-sourced list? I have been noticing the gender disparity in my own book collection for a number of yeas now. I have been trying to buy and read more books by women to balance my collection. Of the 101 single author books I got in 2015: 66 were written by women and 35 were written by men. (this brings my collection to 53% by men and 47% by women). However I am finding that just buying “more books by women” doesn’t always add as much balance to my collection as I am seeking. For example the 17 books by Michelle Sagara (West) I got last year may have added a lot of books by women to my collection, but only one female author. Of the single author books I got in 2015: there were 40 different female authors and 33 different male authors. Part of my focus has been to increase the balance at the grass roots level. When an “A List Author” I like comes out with a book, then I am buying it; so what I need to do is add more female authors to my personal “A List”. What that means is that when I am picking books by first time or new (to me) authors I try to favor books by female authors. I’m a librarian, not a bookseller, but wouldn’t it make sense to want to carry a different set of books (with bestseller overlap) in your airport bookstore than travelers can find in other airport bookstores? If I travel a lot, or I’m making a long trip, I might want to visit several different bookstores in different airports. If they’re all the same stock, I’m going to get bored doing this very quickly. Give me something new! Give me an independent bookstore feel. I realize having a feminist bookstore or a QUILTBAG bookstore in an airport may not be the best business decision ever, but you can still put a personal stamp on it to avoid being a cookie-cutter airport bookstore. Fortunately, no one is suggesting that all bookstores stock the same books. I meant that they already seemed to be. 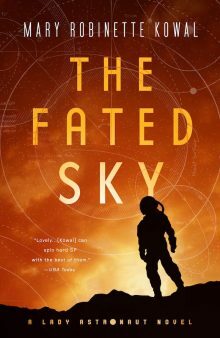 We go out of our way to look for interesting titles in not only the SFF category, but across the board. It’s a bit of a moving target, because all five of our stores at ORD are dramatically different. Each store is very small, with the largest being under 1000 square feet, but also has a unique customer base. It’s so rewarding when we’re told that we have wonderful bookstores, and we even have regulars that go out of their way to connect through Chicago to shop with us (Brandon Sanderson is a prime example). Please stop in next time you’re in Chicago. I’d love to hear your feedback on our titles as well. Clarification request: are co-written books eligible, or is this list 100% female works? Example: Building Harlequin’s Moon was written by Larry Niven and Brenda Cooper. Not a new title, but the best example I could think of off the top of my head. Also, as the book buyer for a library system, I really appreciate this list. I’ve been working on diversifying our SFF offerings, so lists like this save me time and effort that are often in short supply when balanced against the needs of higher circulating collections.